I'm so excited that I finally found time to do this review! Quite awhile ago, Influenster sent me a sample of Black Opium perfume by Yves Saint Laurent. When I read the details of the fragrance, I wasn't excited to try it. I like light, fruity scents, particularly citrus. 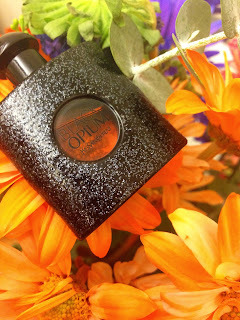 But Black Opium is described as an "addictive gourmand floral" with "notes of black coffee," white florals, and vanilla. I put it on for the first time and was surprised to think, "This isn't that bad." I drove to work and realized, "It smells really good in my car." Then as I started work I just kept sniffing myself. I felt self-conscious because it was a different fragrance than I'd normally choose, but I was falling in love with it. So I wondered if maybe I was wrong and I actually smelled bad. The perfume sort of reminds me of Kate Walsh's Boyfriend. It's like...masculinely feminine? But even more feminine than Boyfriend. Clearly I'm very good at describing scents. Bottom line: I love this stuff. It's perfect for work and play, for fall and winter. The sample bottle has lasted a surprisingly long time, but the full-sized one is going on my Christmas list. I received this product complimentary from Influenster for testing purposes. But, as always, I will never post opinions on De Nouveau Review that are not completely my own.